A few weeks ago I finished reading the fantastic book Scorecasting. One of the more interesting chapters in the book deals with home field advantage and what actual advantage(s) it confers to teams. I won't spoil the conclusion, but its not what you think. The authors later look at how crowd size may have accounted for these advantages. 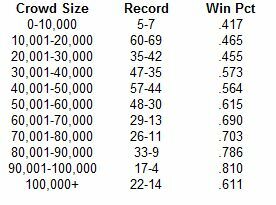 Feeling inspired, I decided to take a look at how crowd size affected home field advantage in 2010. I didn't look at any particular telling stat (penalties, yards, touchdowns, etc. ), I simply looked at whether or not the home team won, and then what the crowd size for that game was. I then, very unscientifically I might add, divided the crowd attendance into ranges of 10,000 and calculated the winning percentage for each range. The results are summarized in the table below. That looks like an almost perfect relationship. As crowd size increases, the home team is more likely to win (up to a certain point--adding a few thousand more folks north of 100,000 doesn't appear to make the home team more likely to win). However, there are some caveats. First, sample size is an issue for a few ranges. 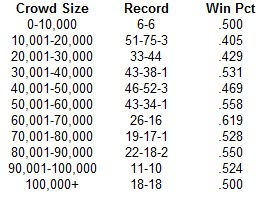 Only 12 games were played involving 10,000 or fewer spectators. These were all games involving either MAC, Sun Belt, or WAC schools. There were also only 57 games played in front of more than 90,000 fans. These games all involved SEC, Big 12, or Big 10 teams playing at home (some of their opponents were mid-majors). This brings up a second issue. Better teams tend to have bigger stadiums. It doesn't make sense for Akron to have an on-campus stadium that seats 96,000 fans. Likewise, it doesn't make sense for Ohio State to have a 30,000 seat stadium when they have more undergraduates than that currently enrolled at the university. If only there were some unbiased way to look at two teams and determine whether or not the home team is more likely to win in the first place. Thankfully, for our purposes, and for degenerates nationwide, there is. Its called the point spread. This next table summarizes the home teams record Against the Spread (ATS). For those who do not know what this means, I present a quick example. Lets say the road team is favored by seven points against the home team. If the home team loses the game by six points, they cover the spread and 'win' for our purposes. If they lose by eight points, they 'lose', and if they lose by exactly seven points its a push, or for our purposes, a 'tie'. Now, here's that table I promised. Based on their record against the spread, home team's performed better as crowd size increased. However, once again this was only up to a certain point, and that point is much lower than the previous threshold for simply winning the game. As the crowd size inched north of 50,000 or so, the added fans provided no real boost to the home team's hopes of covering the spread. Here's another way of looking at the data. Any gambler worth his salt would give his best parlay card for a guaranteed winning percentage of 57%. If you occasionally make plays on college football, keep crowd size in mind when placing your bets. And you can feel free to send any large windfalls my way. We have come to the end of our season recaps. We conclude by examining the Sun Belt, a mid-major conference that will be celebrating its 10th anniversary in 2011. If you feel like it, send them a gift of tin to their league office in New Orleans, Louisiana. For a primer on whats going on here, check the link to last year's SDPI post on the Sun Belt. As usual, this first paragraph will explain how SDPI is calculated. So if you want the meat of this article skip on down. In the 2010 Sun Belt regular season, conference play only, the average Sun Belt team gained and allowed 3060.78 yards. The standard deviation for yards gained (offense) was 374.94 yards. The standard deviation for yards allowed (defense) was 138.99 yards. North Texas gained 2961 yards and allowed 3173 yards. Their offensive SDPI was -0.27 = [(2961-3060.78)/374.94]. Their defensive SDPI was -0.81 = [(3060.78-3173)/138.99]. Their total SDPI was -1.07. This number ranked 8th in the Sun Belt. Here are the 2010 Sun Belt standings. 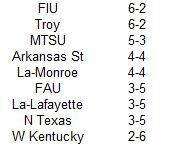 Now here are the 2010 Sun Belt SDPI standings. The standings are sorted by total SDPI with ranking for each category (out of 9 teams) in parentheses. For the fifth straight season, the Troy Trojans claimed at least a share of the conference title. joining Ohio State as the only other IA team to accomplish that feat since 2006. For the first time in the league's short history, the Sun Belt sent three teams to the postseason, with Troy and Middle Tennessee State making their third and second consecutive trips, while Florida International made their maiden voyage. Elsewhere in the league standings, Western Kentucky broke a 26-game losing streak when they beat Louisiana-Lafayette in late October. Speaking of the Hilltoppers, in their second season as full-time Sun Belt members, Western Kentucky managed only a pair of league wins, but they were oh so close in several others. The Hilltoppers were just 1-4 in one-score games, falling to Florida International, Louisiana-Monroe, Florida Atlantic, and Middle Tennessee State by a combined 14 points. The Hilltoppers were just a few plays away from finishing in the middle of the pack in the conference instead of the basement. Middle Tennessee State finished all alone in third place in the Sun Belt, behind co-champs Florida International and Troy, but their play was more indicative of a team with a losing record. In their three game winning streak to end the season, the Blue Raiders beat both Western Kentucky and Florida International by a single point to keep their bowl hopes alive. The Trojans needed their offense to be spectacular in order to lay claim to another league title because their defense was among the worst in the conference. Where oh where has Rusty Smith gone? The Owls were held below 300 yards in half their conference games, and for the season averaged just 310 yards per game against Sun Belt foes. This was perhaps the biggest shocker during all the SDPI analysis I have done. While the Hilltoppers don't appear to be particularly stingy on defense (allowed 349 yards per game in league play), they were never really torched by anyone save Troy (491 yards allowed). 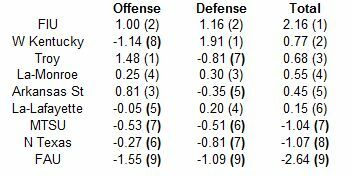 In a league with a small defensive range (Florida Atlantic, the worst defense, allowed 52 more yards per game than the Hilltoppers), Western Kentucky did just enough to earn the number one ranking. 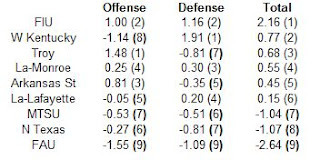 As mentioned above, all the defenses were very close in the Sun Belt last year. The Owls just happened to have the worst showing. While it may not seem like it based on a cursory knowledge of the Sun Belt, over the last half-decade, the Troy Trojans have dominated their mid-major conference brethren in a similar fashion to Boise State. The Trojans have won at least a share of the Sun Belt title in each of the past five seasons, and in that span are seven games clear of the team with the second best record (Middle Tennessee State). How do the Trojans stack up in their dominance with leaders from the other ten conferences? Glad you asked. Only Ohio State and Boise have been more dominant in relation to the other teams in their respective leagues than Troy. 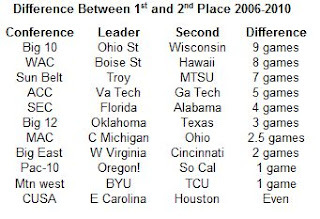 Notice also that Oregon, not Southern Cal has posted the best Pac-10 record over the past five seasons.